There’s a lost place in the Mexican map known as Cabo Pulmo. Divers from all over the world look for it the same way Cortes looked for the Island of Calafia. Furthermore seems like it was here were Jacques Cousteau fell in love with Baja. When you ask for Cabo Pulmo, the ones who’ve been there, smile. Its no wonder, we’re not just talking about a marine park – enacted as natural heritage by the UNESCO – south of the Baja peninsula. Besides, it’s a successful project where the community organized to protect and avoid exploiting this sanctuary and making it a sustainable project. Getting there no easy task, that’s why those who really want to get there, get there. Its easier to get there from La Paz or San Jose del Cabo. San Jose is the better option because the distance is shorter. From there on you have two options, depending if you’re traveling from Las Cuevas or Shipwreck Point. The first one is a paved road thus easier to travel on. The second one is a dirt road, but with a breathtaking views where you will encounter endless world class surfing spots. Arriving at Cabo Pulmo, just relax. This is a tiny fishing community that can be walked from tip to tip in only 10 minutes. Most of the economy here is tourism oriented. Snorkeling, diving, trekking, sports fishing are services offered by the locals or just sip a coffee and enjoy the view. Thousands of fish coming together during reproduction courtship. In the afternoon, these fish form a massive spawning aggregation around the reefs of the National Park. The diver in the image is David Castro, a local divemaster of Cabo Pulmo who has been working together with his family, in the protection of the Park that has been close to any fishing activities for the last 17 years. This no-take marine reserve has allowed the recovery of many species and the historical abundance of predatory fish such as Bigeye travellies. This is arguably one of the best places in all of the Baja strip. 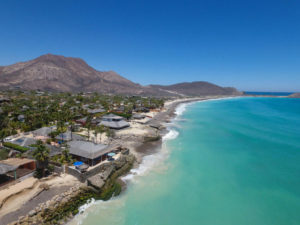 Cabo Pulmo is a natural protected reserve that was enacted in the 80s due to overexploitation and depletion of fishing resources. Things were so bad 80% of the volume of species were gone. The government created this 27 square mile sanctuary that is a symbol of national pride, all of the species have returned to normal levels or exceeded past numbers, flora and fauna are thriving. 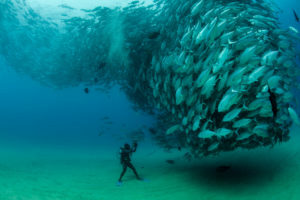 Cabo Pulmo is considered the aquarium of the world and boasts the most varied array of marine life in the world. Recently the prestiged publication The Economist made an article praising the success of this project. The change of a fishing oriented economy to a one focused on tourism especially eco-tourism has helped in achieving this. Next story Looking for the best Mexican car insurance at the border?